Paul Maloney Bio - google03ac510ffe1e8761.html | 2017-2018 #1 Car Leasing Service Experts in NY, NYC, NJ & CT. I was introduced to the auto industry 1993. I quickly advanced, learning from top professionals, becoming a Fleet Director for Toyota, Lexus, BMW, Jaguar, Mercedes, Land Rover, Alfa Romeo, Volvo, Subaru, Mazda, Mitsubishi, Nissan and Ford. Working in fleet, my customers' needs are my first priority, and committing to always be readily available for them throughout the purchasing process. My clientele has a wide range of individuals, which included Fortune 500 companies and their executives, celebrities, professional athletes and musicians. Today, with over 20 years and 10,000 plus sold vehicle in fleet management and working for some of the most prestigious automotive brands, I knew the time was right to create an entirely new business niche. After learning over 70% of U.S. consumers surveyed said they'd prefer to buy their next vehicle online from the comfort of their own home rather than go to a car dealership, I formed Car Leasing Concierge. As the Owner and President I help clients create their own reality through a user-friendly Car Price Check system, which stands alone in the market for savvy buyers seeking a simple, low-cost, time-saving way to purchase or lease a new vehicle. Through our consultancy, our clients pay only wholesale pricing -- better known as fleet pricing -- for any vehicle they're looking to lease or buy, while avoiding the inconvenience of having to go to a car dealer and pay for all the over-inflated, game-playing prices and extra fees. 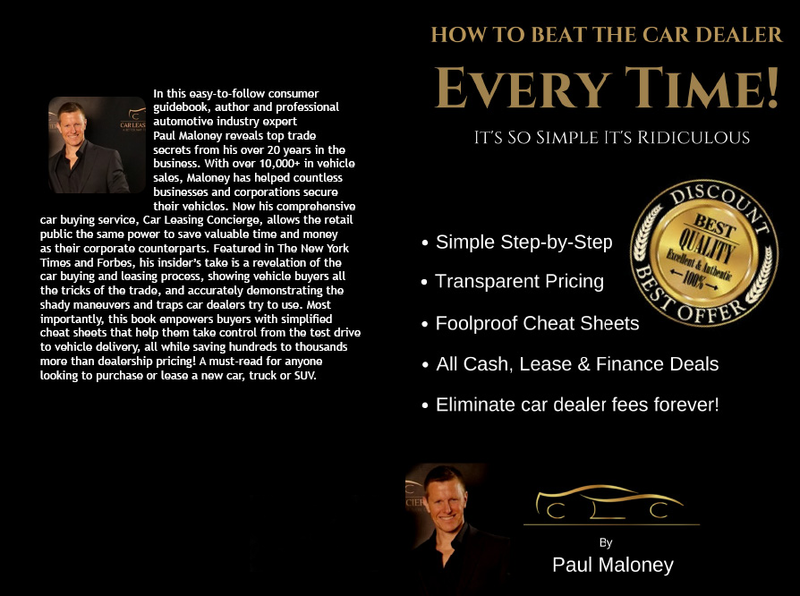 "How To Beat The Car Dealer Every Time! It's So Simple It's Ridiculous!" My no-wait concierge service ensures delivery of your new vehicle to your home or office, accompanied by simplified paperwork ready for you to sign. We'll then finish up with a new car orientation -- all within 24 hours. I look forward to assisting you or your business when in the market for your next new vehicle.